Welcome to India, You will be received by Premium India Tour representative at airport and assisted to your hotel. In the Hotel you will have a brief description of your tour and the representative will hand over your documents regarding the tour, Rest of the time at leisure. Overnight in Hotel. Breakfast at hotel. Enjoy sightseeting tour of Trivandrum and later drive to Kovalam which has one of the most beautiful beaches of the world. The surf here is ideal for surf riding and the water invites the visitor to ride the "Catamaran" or log with the fisherman, or to take a cool swim. Nearby is the Beach center of aquatic sports. Arrive & check in hotel. Rest of the day free to relax & exploring the beach. Overnight at hotel..
(By Road) After breakfast, we drive to Quilon one of the oldest ports of the Malabar Coast and were once the center of international spice trade. Quilon is famous for its delicious Cashew and Seafood. After checking in hotel we set out to see some historic remains and the temples built in ornate style. We also visit the village to know the life style and culture of locals. Overnight at Quilon. (By the backwaters) Breakfast at hotel. From Quilon, we take Kerala's traditional houseboat for Alleppy, which is a fabulous way to explore the fascinating beauty of the backwaters. We reach Alleppy by next day morning. Use the rest of the day in exploring and in shopping. Overnight at Houseboat. Alleppey: Alappuzha, formerly named as Alleppey, in Kerala is one of the major backwater destinations. The thrilling boat race awaits you at Alleppey or Alappuzha. Imagine to just lazing on a houseboat or enjoying fishing in Alleppey Kerala. Kuttanad is also known as the 'rice bowl' of the state, Kerala India. Alleppey is a captivating destination in Kerala India that provides backwaters, traditional Kettuvalloms (house boats), beaches, boat race, swaying palms, gourmet delight and many more. .
(By Road) Leisurely breakfast in the morning. We reach Periyar by noon. After lunch we take safari to a nearby Coffee Plantations & villages. Periyar: One of the well known wildlife sanctuaries in the south, Periyar sanctuary attracts a large number of nature lovers every year. Also called the Thekkady Wildlife Sanctuary, this place is ideal for watching the animals in their natural habitat. The forest here, slopes into the manmade lake at the bottom of the hill. This lake serves as the waterhole for the animals and they come here to drink or take a dip. Elephants, Gaur, Sambhar and even tigers can be spotted here. There are boat services which takes the visitor around the lake. The best season to visit the park is between October and June. Spread over 777 sq.km of the Cardamom Hills of Western Ghats, the Periyar sanctuary is located 137 km from Madurai. Although an excursion on the splendid artificial lake is the standard way to experience the sanctuary, you can also walk around with the local guide in a small group. Wild Elephant herds come to the lake to frolic in the water. Other attractions of the sanctuary are the Sambhar, Bison, Spotted Deer, Tigers, Leopards, Malabar Flying Squirrels, Stripe necked Mongooses, etc. There are over 260 species of birds here, including Nilgiri Wood Pigeons, blue-winged Parakeets, White bellied Tree Pies, laughing Thrushes and Fly Catchers. (By Road) From Periyar we continue to Munnar set amid Southern India's most dramatic mountain scenery and the combination of craggy Peaks, Manicured Tea Estate. Crisp mountain air makes Munnar a delightful alternative to the better known hill stations of Tamil Nadu. It is a perennial favorite of 'Honeymooners' and offer magnificent scenery and wonderful walks. At Munnar you are free to explore its beauty of nature. Complete day at leisure. 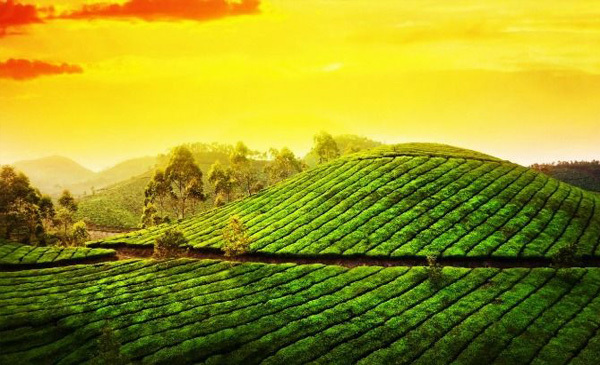 Munnar is situated at the confluence of three mountain streams namely Mudrapuzha, Nallathanni and Kundala. This hill station, located at an altitude of 1600 m above sea level, was once the summer resort of the erstwhile British government in South India. Sprawling tea plantations, picture book towns, winding lanes and holiday facilities make this a popular resort town. Among the exotic flora found in the forests and grasslands is the 'Neelakurinji'. This flower which bathes the hills in blue every twelve years will bloom next in 2006 AD. Munnar also has the highest peak in south India, Anamudi, which towers over 2695 m. Anamudi is an ideal spot for trekking. Breakfast at hotel. Transfer to airport for flight back to home.